Aerial refuelling today is, as far as I know, exclusively within the domain of the military. But strange as it may seem, it was born into a civilian role. Sometime prior to 1938, the decision was made to establish two refuelling stations: one in Shannon, Ireland, and one in Botwood, Newfoundland. The Yapton refuelling Company from Yapton, England, selected the twin engine Handley Page Harrow aircraft for the task. They were modified to carry a large fuel tank in the belly along with a few hundred feet of hose. The two aircraft were shipped to St. Hubert, Quebec, reassembled and flown to Gander sometime in 1938. The two aircraft would fly east toward Gander while refuelling. Considering the sophisticated refuelling done by the military today, the 1939 exercise was rather dangerous to say the least. The tanker would play out a black four-inch rubber hose while a crew member of the flying boat would try to get the end with a grappling hook while reaching out through a side door. (It would be interesting to know how many times the hose came close to, or struck, the propellers of the flying boats.) 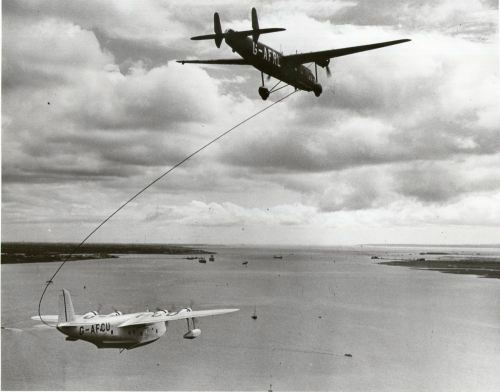 Once the hose was caught, the pilot of the flying boat would radio to the tanker to activate the pump. Barring any turbulence, the fuel would be transferred into the flying boat's spare tank. Eight round trips, carrying mail, were completed by the two S30s, supported by Harrow tankers. The two pilots, Johnson and Atkinson, were on loan from the Royal Air Force but were recalled as soon as World War II broke out on September 4, 1939. The aircraft were pushed to an unused portion of the airport and later sold to a company for private use. Gander was one of the first places in the world where aerial refuelling took place. Thanks to the late Mr. Roland Goodyear we have a first-hand account of a good portion of the history of the experimental aerial refuelling. Sir Alan J. Cobham, K.B.C. My most humble apologies for not replying to yours of March 30th before this time. Life here is absolutely hectic and one doesn't get any time to keep pace. You are going to see a great deal more of us in the not too distant future, and I personally look forward to the time when we shall be able to renew our good acquaintanceship. Regarding the story that you want, I am merely writing my part in the history of Gander for you to edit and knock about as you will. It was in May, 1939 that I arrived on the partially completed runways of the airfield with a twin engine Harrow, the largest aircraft ever to have landed on the soil of Newfoundland. Two days later, my co-pilot Atkinson, brought the second aircraft over. We took possession of the famous hangar No. 20 with a party of nine Englishmen and two Newfoundlanders. From this airfield, at which time was still under construction, we operated the aircraft for practice flying, pending the commencement of the refuelling trials with B.O.A.C., who were flying into Botwood with the Empire boats. Our task was to refuel the outgoing boat at 1800 hours local time on the Friday of each week for two months. During this period, and while the trials were in progress, war was declared and my instructions received from the British Air Ministry were to the effect that the trials were to continue as scheduled, after which I was to form a collaboration with Neil Richardson of B.O.A.C. (British Overseas Airways Corporation), to check all the radio aids that had been installed, and to operate every day that I felt necessary for 365 days, in an endeavour to prove methods which would enable aircraft to operate from the airport throughout the year. This, as will be realized, was in preparation for the Atlantic ferry. I asked for, and obtained, the services of Robert Bradley, who had been Superintendent Engineer in constructing Gander Airport under Mr. Jewett. Through Bradley's efforts, equipment was devised, and an organization set up under his jurisdiction, to compact the snow, whilst my side of the operation was to ascertain whether we could operate. By this time, Gander Airport in its original plan, had been completed, the constructional staff having left and there being the Airport staff and such residents as my own party totalling altogether a hundred people. My unit merely comprised some nine souls. We were successful in the work we set out to do, and we did in fact operate with the exception of about four days, this being the worst period of the break up. In June of 1940 my Company's first part in the history of Gander had been completed. The aircraft were taken over by the Royal Canadian Air Force, and myself and my staff got into uniform. In 1947 arrangements had been completed to commence a further set of refuelling trials with B.O.A.C., but on a much larger scale. I, as the representative of this Company and with my intimate knowledge of the flying conditions of Gander and Labrador generally, visited Gander and made the necessary arrangements with the Airport authorities to take over our old hangar and to obtain accommodation in the Airlines Hotel for a staff this time of some thirty or forty souls. Thus was my acquaintanceship renewed with my old friends and with a much enlarged Gander, by Christmas 1947. On this occasion we operated the Lancasterian aircraft that we had purchased from Trans-Canada Airlines, for the purpose of refuelling a B.O.A.C. Liberator which was scheduled to fly once a week on a non-step service, London – Montreal, Montreal – London, and this for six months of the winter, and once again was this work successful. Some fifty-six refuelled crossings were made during this period. We did open up a second base as a safety bet, at Goose Bay, but after some operation we were confident that, with the aids and efficient staff that were in control at Gander Airport we could dispense with the Goose Bay base and place all our operation through Gander. This we did, by transferring our stores, staff and aircraft from Labrador down to Newfoundland, and for the latter part of this series of trials, the Gander base covered all the refuelling carried out on the West side of the Atlantic. Our operations terminated at the end of May, 1947, and although our aircraft and staff flew back to the home base in the United Kingdom, we still continue to rent premises at Gander to this very day, to house our equipment and stores that we have left behind. We are glad to do this, because we have every intention of coming back to Gander to operate a tanker service for all the airlines of the world requiring the same, and we estimate that in about two years time we shall have completed the necessary negotiations to establish ourselves on a permanent footing with an organization in Newfoundland based at Gander. It cannot be stated at this time, the size and extent of the organization can visualize, but I can assure you that it will be of a very different order to anything that we have so far put into Gander. We, therefore, can claim that we were the first people to carry out any serious operation at Gander, other than MacGregor with his Fox Moth, conducting a meteorological service, and we may well be the largest and the most permanent organization that Gander will cope with in the future. We predicted these things in 1935, before Gander was even conceived, and the time is not far distant now when those early predictions will be proven. I hope that this information will be of some use to you. Kindly accept my kindest regards and convey the same to all my other old friends. The development of land-based aircraft capable of carrying full loads from Gander across the Atlantic put an end to the company's plans. Editors Note: More technical information on In-Flight Refueilng History in Gander can be found at this link. Also the history of Sir Allan Cobham the inventor of in flight refuelling. Cobham's company Flight Refuelling Ltd. returned back to Gander after WWII to further experiment with in flight refueling.